You have 40 or so business executives flying to Chesterfield for an annual corporate event and are wondering how they can all travel in style from the airport. Our 49-seater coaches offer luxurious and spacious interiors. Passengers get sufficient legroom to stretch such that even long distance trips are not as tiring. The cargo space available eliminates the need to have luggage travel separately. Check out our Chesterfield minibus hire packages for reasonable rates that will take the stress out of your transport plans. 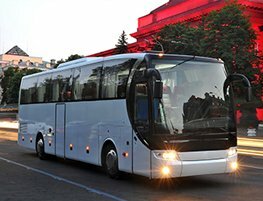 If you want to take excursion tours around Chesterfield and its environs, our 49-seater lets all of you enjoy the trip as a group. With a well-trained driver at the wheel, the excursion group can marvel at the attraction and make spontaneous stops for a memorable Chesterfield experience. If a bride-to-be wants the last night out with her friends, we will help you plan a suitable trip. For horseracing lovers who intend to attend the Cheltenham festival or the Royal Ascot as a group, our 49-seaters are at your disposal. Our experienced representatives are available to help with your itinerary, depending on the type of trip. We plan every journey with the same focus whether it is a family day excursion or a wedding transport. For airport transfers, sporting events and parties, contact us for Chesterfield minibus hire to book a modern and well-equipped 49-seater.